Celebrate Valentine’s day at Moon Games on the amazing Valentine’s Victory Jackpot Slot! It doesn’t matter if the day is close by or not, this game will fulfil your valentine’s goals with Random Logics two progressive jackpots! Valentines Victory is a 5 reel and Cluster Pays slot game, that allows you to win big from the symbols on the reels. Find seven main symbols on the reels, which are all heart shaped cookies which are differently decorated. The highest paying symbol is the Box of Chocolates, which pays out a massive 500x for a four-symbol combination. The Wild Card of the game is the Pick Me Heart symbol which activates one of the bonus features of the game. Your objective on Valentine’s Victory Jackpot Slot is to form winning combinations with clusters of four symbols anywhere on the reels. In the paytable, you’ll find the shapes you need to form to trigger a win. Bet Levels: No bet lines present. Amount of Paylines Selection: There are no paylines on this slot game, Form clusters of four symbols to trigger winning combinations. Coin Values: Place your bets from the lowest amount of £0.25 to the highest amount of £250. 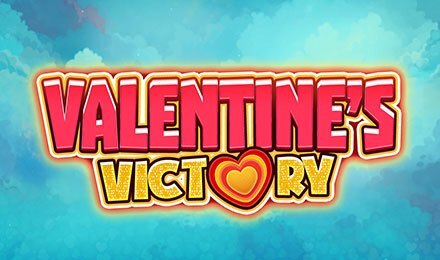 Valentines Victory Jackpot Slot consists of two main bonus features; Pick Me Bonus and Free Spin Combos. Activate this bonus round by landing the Pick Me Bonus symbol on reels one and five within the same spin. Here, you’ll get to select icons which reveal an array of multipliers that is multiplied by your stake at the end of the feature. Valentine’s Victory Jackpot Slot also consists of two progressive jackpots. You’ll find the values of these jackpots on top of your reels. Jackpots are won at random. The higher your stake, the better your chances are at triggering one.